An awesome throwback that recalls the great class-crossed lovers anthems without borrowing too heavily from them. Yes, it’s been done before, by John Conlee, Travis Tritt, and Randy Travis, just to name a few. The rich girl that falls for the roughneck country boy, who just can’t handle that high society. Sometimes it has a happy ending, sometimes it doesn’t. But it always ends on the country boy’s terms. He’s sticking to his middlebrow lifestyle with or without her. A fantasy? Of course it is. But it’s an appealing one that reinforces the intrinsic value of blue collar life, where the vast majority of hardworking men and women never get a ticket out. Toby Keith’s music was his ticket out, and he’s made millions more than most of his fans will ever see. But it took him long enough to get there that he can still viscerally connect with his audience, and speak in their voice. A lesser singer and writer couldn’t pull any of that off. In fact, most of the guys on the radio today would have built a weak song around the eye-catching title, instead of a strong song which is far more interesting than even its title suggests. But Keith isn’t just one of the genre’s greatest singers and songwriters. He’s also one of its smartest. When he’s at his best, we get songs that celebrate the working man and the country boy without a whiff of condescension or pandering. 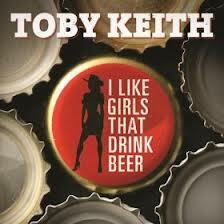 This is Toby Keith at his best. I like that’s also not directly about Beer either, just like “Beers Ago.” No doubt it will sell T-Shirts and Koozies and such though. Glad I’m not out on an island w/this one. I don’t know that I’d go full-on “A” for this one, but it’s far better than I was expecting, given Keith’s recent pattern of leaving his smarter cuts as album tracks in favor of singles that project a misleading, one-dimensional image of what he can actually do. That the title includes perhaps my biggest grammar pet peeve (“that” v “who”) probably doesn’t help. I love this song- its catchy!!! Toby’s the best!!! In fact, most of the guys on the radio today would have built a weak song around the eye-catching title, instead of a strong song which is far more interesting than even its title suggests. That pretty much sums up my initial misgivings about the song before hearing it. I was expecting a song built around the title, and I didn’t think it would be good, but I really do like this. I’m not sure that it’s in my ‘A’ range, but I do think it’s a really fun record. Plus it actually sounds country! Wow, I saw the title and thought this was going to be another one of those crap songs we’ve been getting lately. The first couple of notes really surprised me, and this is a summer song I can get behind. Of course His prior single (A song I also liked) was Beers Ago and I wonder what is up with his beer fetish lately. If we keep getting songs like these two, I say keep it going. …next to travis tritt’s “country club”, which is nothing less than a true country classic and conlee’s finely crafted “common man”, toby keith’ latest release falls a little short on all accounts. then again, it’s well done, well timed and it should be a lot of fun to sing along to its chorus in a honky tonk full of the song’s protagonists around midnight or so. thats what a i call a jolly nice and purposeful effort. Totally agree with the review of this song. Keith has big-time talent that often gets overshadowed by some of his posturing, and by songs that are just kind of silly. “A man ain’t gonna get it up here” – bahahaha seriously was not expecting that!